This is due to balanced 'electrochemical' reduction and oxidation processes occurring inside the brick at the two faces. As long as electrodes at these faces are at different temperatures, the electrochemical reactions occur and electricity is generated. The compounds inside are not consumed, do not run out and can never be overcharged. As long as there is a temperature difference there can be electricity. For example, if a house or shelter's outside wall is sunny and hot, but the interior shaded and cool, electricity can be produced by the wall. Access to electricity in buildings is a continuing world challenge, especially in undeveloped countries or refugee camps. Here, electricity is simply unavailable or unreliable. Light at night time is known to significantly enhance productivity and education, by allowing life and study to continue outside the limits set by the rising and setting of the sun. Many electronic devices such as mobile phones are also significantly enabling. By using gelled water inside the brick, and adding a 3-D printed interior based upon a Schwarz D minimum surface structure, the thermogalvanic bricks are stronger than household bricks. 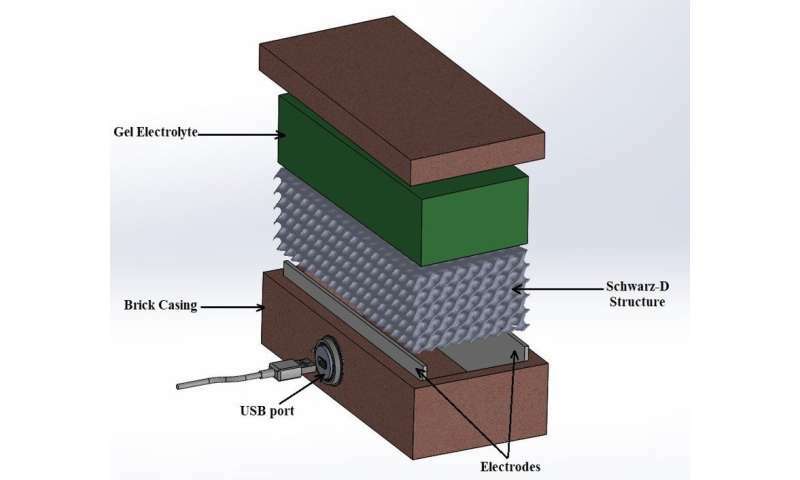 They allow the electrochemistry to occur and also serve to improve insulation. The team—including scientists from Arizona State University and UNSW Sydney, as part of a PLuS Alliance partnership—believe that this new device could help provide access to affordable and sustainable energy, independent of an electrical grid. Four undergraduate students, including two King's Chemistry students, helped implement the key experiments to prove these devices could work. The team has now filed a provisional patent for the bricks. Leigh Aldous, Senior Lecturer from the Department of Chemistry at King's said: "The idea is that these bricks could be 3-D printed from recycled plastic, and be used to quickly and easily make something like a refugee shelter. By the simple act of keeping the occupants warmer or cooler than their surroundings, electricity will be produced, enough to provide some night time lighting, and recharge a mobile phone. "Crucially, they do not require maintenance, recharging or refilling. Unlike batteries, they store no energy themselves, which also removes risk of fire and transport restrictions." Conor Beale, a 2nd year undergraduate Chemistry student at King's who worked on the project said: "What is so interesting is that we can take something so common and never thought about, such as temperature difference in houses, and use it to create electricity. For a family living in a developing country, this could have a substantial impact."